A. Djime is a duo. 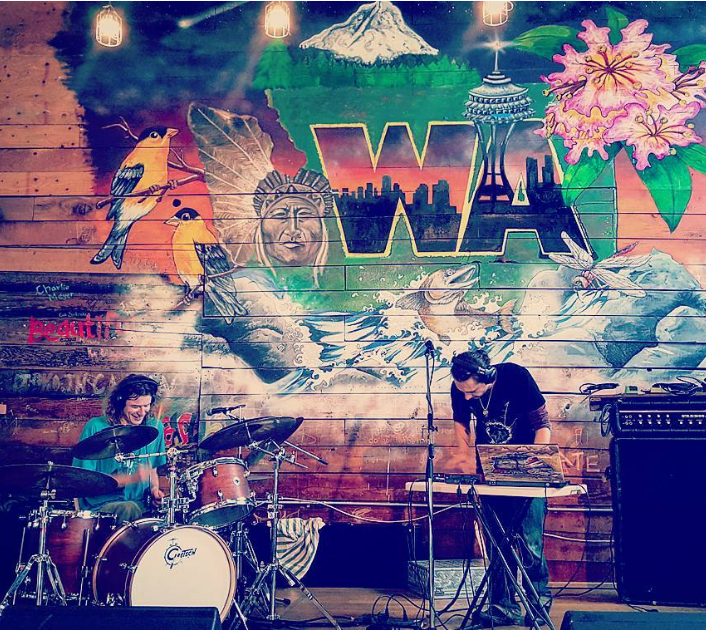 James & Ian are both trained musicians and lifelong noisemakers, they met in Seattle at a local open mic and started working together on Djime in January 2016. A. Our style is swelling guitar builds with high energy synthesizer leads, deep driving bass with thickly layered distortions, mangled drum machine percussion, and live breakbeat jazz drumming. A. Having just completed our first full-length album our current goal is to pursue local (possibly regional) shows to help grow our fanbase. In terms of actually what we are literally working on, James has been considering new ways to develop songs with softer dynamic, possibly even slower or more ambient songs. We are also considering a few collaborative projects with other artists we know. We have between 2.5-3 hours of live performance material, so ideally we can get that to at least 3 hours of actual set play time within the next 2-4 months. A. Get weird! Let loose, feel free to feel differently, be open to the universe.